Hope's Cafe: SFF-Sassy Scrubs $25.00 GC Giveaway!! Karen also informed me that Sassy Scrubs is going to be carrying some neat new products in addition to scrub tops and pants! My little sister would love one of the kids scrub sets! They have some really cute aprons, scrunchies, even ties! And with over 1400 fabrics to choose from, you could find a print or design for anyone and any occasion! 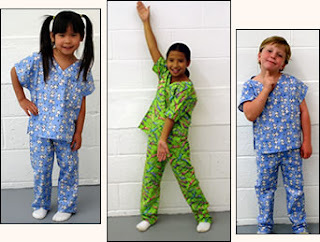 "Sassy Scrubs began nearly two decades ago as an alternative choice for medical staff. Bored with the bland solid color scrubs which were their only options at that time, medical, dental and veterinary staff quickly discovered they had other options at Sassy Scrubs. The business grew steadily, gaining repeat customers around the world. The founder's poor health and an unclear business progression slowed the business in the late 1990's. After experiencing a two year hiatus, Sassy Scrubs was rejuvenated and invigorated in 2003 by the current President, Karen Bradley. Having owned her own Nursing Agency for nearly a decade and a half, Karen was ready for a new challenge. Switching from managing people and finding the right fit for her staff, to managing a scrubs company and finding the right fit for her customers became an exciting, and fun, challenge. A lifelong interest in sewing and fabric helped make the transition easy and the decision to keep the garments custom made was just as easy. Under Karen's vision, the choices offered to all Sassy Scrubs customers have grown exponentially. But the quality of the products and the exemplary customer service is still unchanged and outstanding. Begun in Upstate New York, Sassy Scrubs is still here, in a small rural town where each piece ordered is carefully cut and sewn individually. Our staff sews each piece from beginning to end so they "own" each garment they produce. No one sews countless pockets, side seams, or hems all day, as in large factories. Our seamstresses care about the items they produce for our customers and their quality shows in each piece produced. We make our garments as we'd want them made for ourselves. Good quality, well made, and one piece at a time. Sassy Scrubs was the first company to offer print designs in scrub wear and the first to offer cotton as a fabric choice. 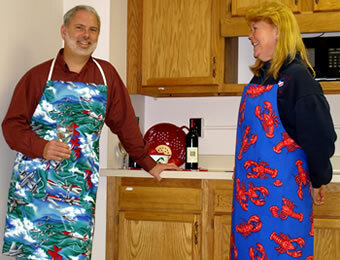 Our company also saw the need for a broader size base for our customers, offering sizes from XXS to 6XL. Customers needed more choices for size and for length of garments. Customers wanted more variety. Sassy Scrubs recognized that need for choices. And we delivered." So, would you like to go shopping at Sassy Scrubs?! One of my readers will win a $25.00 gift code to Sassy Scrubs!! Go to the Sassy Scrubs blog, leave a comment on this post about how much you like Sassy Scrubs, or tell them you want to win :) and then come back and tell me! (I will check to make sure this is completed). 1 entry-Become a Sassy Family Member! 1 entry-Tell me a fabric you like from Sassy Scrubs! This giveaway ends Saturday, March 5, 2011, at 11:59 p.m. Please leave a valid email address in each comment, as this is how the winner will be notified. Winner will have 48 hours to respond, or another winner will be chosen. Giveaway open to US residents only. Disclaimer:I was not monetarily compensated in any way for this post. All thoughts and opinions are mine. All quotes taken from the Sassy Scrubs website. left comment on Sassy Scrubs blog. I commented on their post! I signed up as a sassy member! commented on post as Rachel R.
I went over and commented. Please enter me. Thanks! Left a comment on Sassy scrubs blog post!